Battlefield: Bad Company 2 developer DICE would once again like to remind everyone that unlike certain other development studios that shall remain nameless, they love the PC and are doing their absolute best to ensure that the platform gets all the attention it deserves. Between the dedicated server uproar and the fact that people who bought it through Steam still can't actually play it, the PC launch of Modern Warfare 2 has been a bit of a mess. That's a fact not lost on the guys at DICE, the studio behind Battlefield: Bad Company, which isn't pointing any fingers but did take another opportunity to point out that its new game won't treat PC gamers like second-class citizens. The PC version of Battlefield: Bad Company 2 is being "tweaked and adjusted" to fit the strengths of the platform, Gordon Van Dyke of DICE told IncGamers. "On the PC, it's a PC version, which is getting that same treatment, and then also a little bit more as PC users are generally used to a different type of experience than console users are, and we recognize that and we want to make sure that we give that to the PC market and give the console market more," he said. He said plans to release modding tools are still up in the air, describing the situation as "really, really complicated," but added that he hoped to get something out to the community. "Once we start getting there and the engine gets to a level where we can release tools that are easy for our own guys to use, and then easy for people publicly, then we'll get into that and we'll really start to focus on it," he continued. "But it's definitely not something that we're like, 'Oh, we won't do that.'" 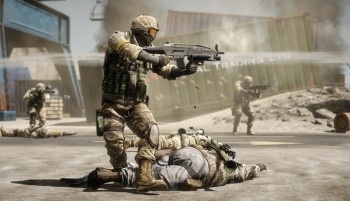 DICE announced last week that a PlayStation 3 exclusive beta for Battlefield: Bad Company 2 would begin in November and Van Dyke said that plans for a PC beta would be announced at a "later date."